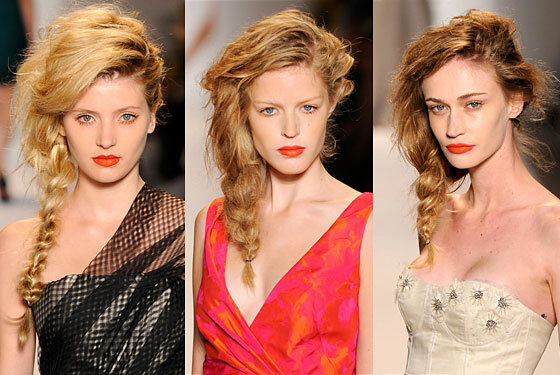 This season, we at Cristiano Cora Studio loved the disheveled side braids that graced the runways at Mercedes-Benz Fashion Week. It’s easy and here’s how you can create the style at home. This style works great on long hair, but don’t be afraid to experiment with extensions if your hair is on the shorter side. 1. Part your hair on the side. If you have bangs, choose the side opposite them. 2. Separate hair into three parts, Take one two – three inch pieces of hair from the front of your hair on either side and gather the rest of your hair in the middle down your back. 3. Pull this middle section to the side opposite your part, split it into three sections and braid it (if you prefer a fishtail braid it’ll look fab, too!) The fishtail braid is great if you separate with fingers for a thicker, textured braid. 4. Gently push the braid up between your thumb and index fingers using both hands to give it a chunky, loose look. 5. Take the two front sections, spray them with a light hold hairspray and tease them up gently. Pull each section back loosely and fasten the ends with bobby pins back underneath the braid so the pins are hidden. 6. Spray your hair with Glam Power Spray by Davines for great hold. Im back and Im charged!!! I spent a week at burning man in the begining of this month and had the time of my life! Burning man is an art festival that happens every summer and this was my 5th year anniversary. What keeps me going back??? The freedom, gorgeous people from all over the world, art installations that blow your mind! and the best music from the best DJ’s ever! Imagine NYC without one single building, how much space you’ll have. Now imagine living in a space larger than manhattan with not a building in site all you see and feel is distance, the sun on your body and the breeze flowing consistantly… Your shadows go on for miles…. you could easily close your eyes sooo tight and ride your bike at it’s highest speed and not have a fear in the world that you’ll bump into the next brick wall. You could wear or not wear anything you want and feel like the sexiest being that ever existed. You can play and play and play with 80,000 people who are instantly your friend. It’s the warmest safest feeling I have ever felt. The beauty of every sunset and every sunrise at Black Rock City will always fill my soul with inspiration to love and trust with all my heart. Everyone deserves the chance to feel the purity. Everyone who attends this magical festival will never come back the same because there are so many lessons to be learned in this type of creative environment. It’s we the people who keep burning man alive. There is nothing commercial about this festival. You are not able to buy or sell anything while you are there. We build this city from scratch for a week and everything we bring, we take back with us. Burning man is the kind of thing that if you are pitching your tent alone, 5 people will come running to give you a hand, offer you something to eat and drink to celebrate your new friendship and your home for the week. The people go great lengths to ensure comfort in the harshest of weather conditions no matter where and who you are. 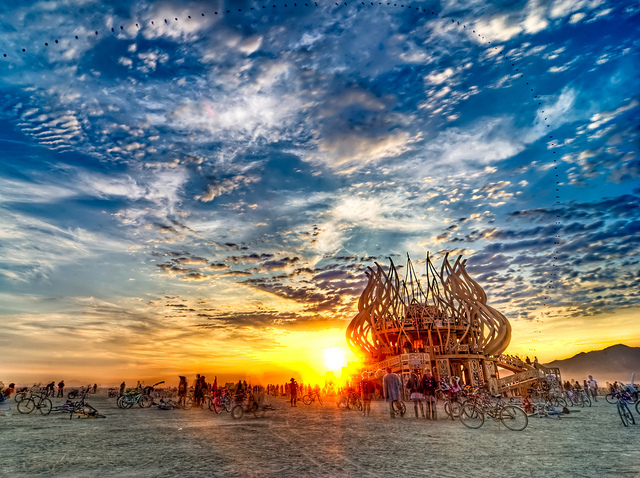 The live spirit of the people is what keeps burning man growing. The art is PHENOMENAL!!! Black Rock City is so large that you will never be able to see it all in just one week but you’ll have a BLAST trying. There are over 300 art instilations from small to massive, interactive and just down right PLAYFUL. Instalations are never the same because everything you bring with you, you must take back with you. Then there are the art cars!!! you could find yourself sailing through the dessert on a huge ship feeling like a Goddess of the sea or you could totally be inside of a dragon that shoots out fire at the greatest lengths…. It’s all just way to exciting and overwhelming. During the day this festival is one thing but at night which is my favorite time is something totally different. You kind of feel like you’re in the largest bubble ever blown! The night sky looks like it’s covered in DIAMONDS. The city is totally built by the time Thursday comes rolling around. You don’t even need a flash light to get around because everything is lit up so beautifuly! Take time out everyday to smile and play, life is something to celebrate! Loving you always, dancing my little heart out. My name is Yexael Alvarez, hair stylist at Cristiano Cora Studio. I would like to take a moment to mention the magic effect of an Updo. In New York City there are always places and occasions to wear a beautiful Updo, this fall is the time to allow your hair stylist to use their special touch to complement that moment with a creative and romantic look. Imagination and the right products are the key. I found the universal moulding mousse and the invisible hair spray by Davines is a good match for the inspiring night. The first step is to apply a small amount of mousse on wet hair before blow drying, to give it a good foundation. 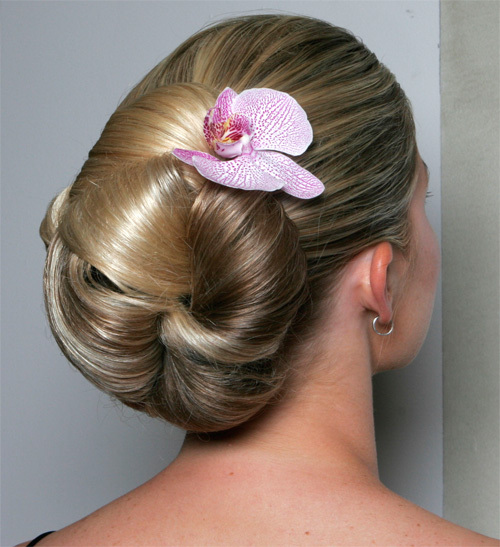 As the updo gets into shape, complement the hair texture with the invisible hair spray. I am inviting you to shine along with the autumn and hair do specially for you. A great haircut can dramtically alter your mood and make you look younger. A good stylist knows that assessing the client facial features is imperative. The key factors are emphasizing attributes and minimizing flaws. So, facial shapes and body shapes are considered to flatter the clients best features and draw faces away from flaws. Elliminating and building weight can give the illusion of longer, leaner or wider face shapes; depending on the individual. Like a nip and tuck, removing bulk where its not needed and building it where it is. Lifting the weight up draws the eye and away from the face. For example, creating leaner shapes helps minimize and soften stronger jawlines to balance off elongated shapes. A good stylist takes all these things to consideration, which flatters the clients features for a more youthful appearance. Arriving to our Salon this September, is our new Keratin Complex Express Blow Out, the sister to the Keratin Brazilian Treatment. Keratin Complex Express Blow Out redefines and expands the Keratin category. This one-hour service reduces frizz, curl and styling time for up to 6 weeks at a $125.00 and up. With this unique formulation utilizing Trionic Keratin Protein and a Co–Polymer delivery system, Keratin Complex Express Blow Out infuses the highest quality of Keratin in the shortest amount of time. This treatment is great for someone who wants to take the edge off of her frizz or who would like to know how her hair would react or possibly look with the more expensive treatment. With this service one can wash their hair in as soon as 8 hours after the treatment is applied. As with the original treatment, it is extremely important to use a sulfate free shampoo after the Service. We highly recommend our Glorifying Shampoo and Glorifying Pak by Davines.